For the past few months I’ve been doing some work for placr, and this week I’ve joined the team full-time. I’m working on a new transport related API *, with some interesting geolocation and realtime dimensions to it. Currently this is all aimed at partner projects and B2B type clients, so I’m afraid there’s nothing fun to show you yet. Hopefully we shall go public with an API at some point, but it’s not the priority at the moment. The work is very interesting, and now that I’m not splitting up my week with other things I can try to build up a bit more momentum. We’ve been starting from scratch. A fresh subversion repo! I wanted to build a RESTful API outputting both XML and JSON, so I’m doing this in Ruby on Rails. I settled on this after doing some experiments with django piston first. Some interesting problems encountered with both though (despite this being very much core to what these frameworks are supposed to be good at) Still plenty of framework details to work out, but it’s all good fun. I’ve also been using various libraries for HTML scraping. The team is following (and getting involved in) the various open government data debates, because we’re looking at making use of some of these datasets. These are a moving target at the moment though, so as we look to develop on top of these things, agility is going to be important. These days I’ve been socialising far too much with techy people, and was rather taken aback when someone (might have been my mum) interrupted me in the middle of my well rehearsed little job description to ask “What’s an API?”. It stands for Application Programming Interface. I rather liked the way Richard Boulton described it as he demo’ed his API at last weekend’s rewired state event. Pointing at a this screen full of data he said “It may not look very nice to you, but to a developer this is beautiful”. That particular screen full of JSON formatted registry office data did look beautiful to me, so I developed this thing last Saturday. An example of an API and an application built to use it. 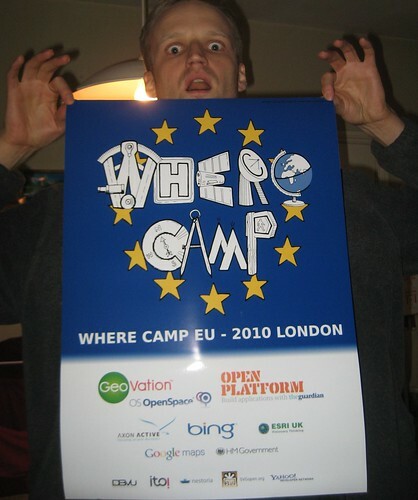 WhereCamp.EU How was it for me? From a personal perspective it was massively enjoyable and rewarding, but the whole thing flew by too quickly. Preparations started months ago, but suddenly on the day there was so much to do, and at the same time so many people I wanted to chat to and fascinating sessions I wanted to see. It got off to quite a blurry-eyed start due to geo-curry with the team the night before, followed by staying up late to prepare slides. As organisers we decided we would need to seed the unconference “wall” with some post-it notes in the first session slot, to get things going and spur other people to participate by setting an example. This meant I was feeling stressed and tired from the off, but it worked well, and despite a lot of people being new to the unconference style, a great atmosphere of participatory buzz carried the proceedings forwards at an alarming pace. This got a pretty small audience because I was up against some awesome sessions from the other organisers, but I guess I’ll get the opportunity to re-use some of these slides on some other occasion. I might change the background colour. I’d had a few beers with the geo-curry, and the purple-green gradient seemed like a good idea. 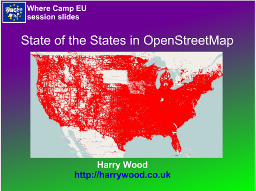 On the Saturday I ran another little session called “OpenStreetMap Practical – Never edited OpenStreetMap? Bring your laptop and we’ll show you how”, which kind of worked, although it clearly needed longer than the 15 minutes we had. The event left me completely shattered, and I was quite surprised when I popped into the pub for a quick pint afterwards to be confronted by a massive crowd of geo-people all enthusiastically continuing the discussions. I’ve just been checking out some blog responses and write-ups of the event: Gary Gale (vicchi.org) , Guardian Open Platform blog , Ed Parsons , Steven Feldman (giscussions) , jokru , Eamonn Neylon , James Cheshire (spatialanalysis.co.uk) As I say, from my perspective the whole thing flew past very quickly and it was quite difficult to know whether the event was actually going well, so it’s gratifying to know that people enjoyed it, and found the format successful. 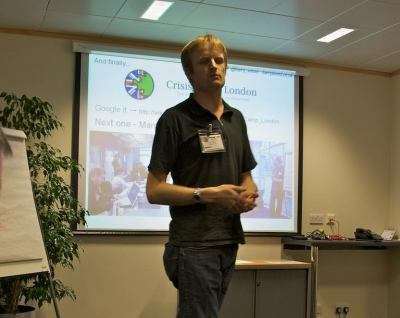 We have a small team of organisers who are all people from the London geo-conference/meet-up circuit. In particular we have Chris Osborne who frequently puts together the very popular #geomob events, and Gary Gale who seems to live his entire life at geo conferences. These combined with a team of five or six others (including myself) have come together to plan two days of geo-map-technology goodness. Gold sponsors: GoeVation & OS OpenSpace, and Guardian Open Platform. Silver sponsors: Axon Active, bing maps, ERSI UK, Google Maps, data.gov.uk. Being an “unconference” we haven’t actually planned the content of the conference in a lot of detail. This is where we’re relying on the imagination and motivation of the attendees. This may sound chaotic, but I’m reliably informed that it does actually make for an fun and fulfilling event. Looking down the list of attendees, I can see that there will be plenty of amazing ideas. Should be a fair amount of OpenStreetMap related stuff hopefully. I’m excited to see what kind of sessions people come forward with.